Creamy chickpea soup with coconut milk & Feta. 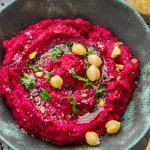 This is a nutrient rich soup that tastes amazing! 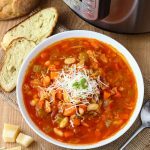 A great homemade soup that is also dairy-free & vegan! A bowl of warm soup does wonders, especially in winter. 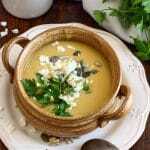 This creamy chickpea soup with coconut milk & Feta will provide you with protein, fiber, vitamins as well as minerals. All these nutrients are important for a healthy lifestyle. Guys, I created this creamy chickpea soup recipe last week and I couldn’t get enough of it! I had it for lunch as well as dinner the same day! And you know what? That day when I opened the jar of cooked garbanzo beans I was not planning on making anything special. I was just going to make a simple pureed chickpea soup with potatoes. But then I saw Feta cheese in the fridge, and flat leaf parsley on the table. I knew they would go well together but I was after way more nutritious meal than this. So I grabbed some mixed seeds we had in one of the cupboards as well as coconut milk and I was happy. It was time to cook this healthy vegetable soup. In a large pot, heat up olive oil. Meanwhile dice the onion. When you are done, throw it in the pot and sauté for 5 minutes. I usually cover the pot with lid and reduce the heat to low-medium. Now you have time to open a jar of cooked garbanzo beans. Drain the water. I also rinse them under running water. Peel and dice potatoes. Wash parsley. 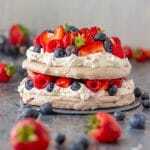 You can chop it roughly but no need as it will be pureed later on. Remove the lid and add the prepped vegetables & sweet paprika. Pour in vegetable broth and turn up the heat to high. Bring it to a boil. Reduce the heat and simmer until the potatoes are ready. This may take 10 – 15 minutes, depending on the potato variety. Now it’s time to puree your soup. After, pour in coconut milk and bring to a simmer. 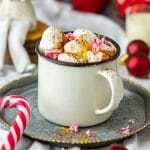 Turn off the heat and taste it. Note: Depending on what vegetable broth you are using, the saltiness level may vary. That is why I prefer to season this soup at very end. You can omit coconut milk, if you wish. 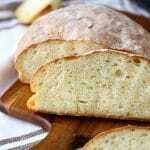 However, the coconut milk gives it extra creamy texture as well as amazing flavor! It’s worth giving it a go. 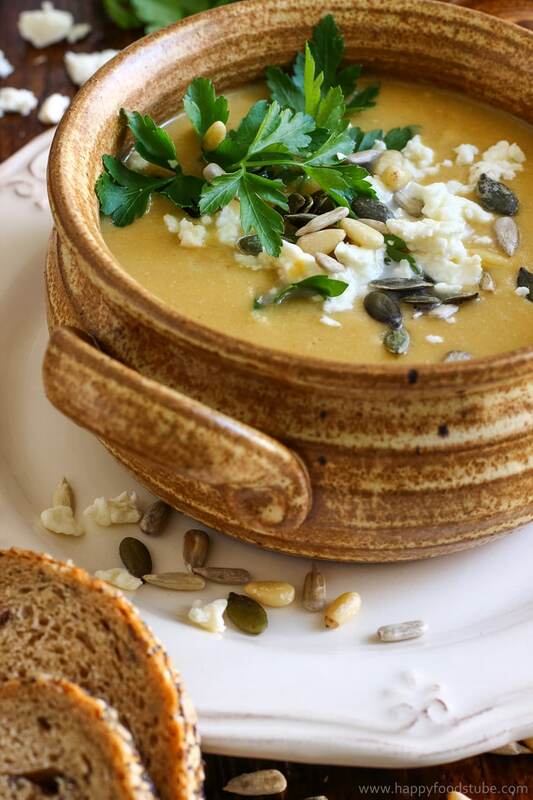 Important: Don’t forget to finish off this creamy chickpea soup with crumbled Feta, loads of seeds and fresh parsley. Trust me – you’ll be in for a treat! So what exactly is so special about this creamy chickpea soup you ask? Anyone can do it – it’s so easy! It’s fast – ready in 30 minutes. Suitable for vegetarians and vegans (omit Feta). 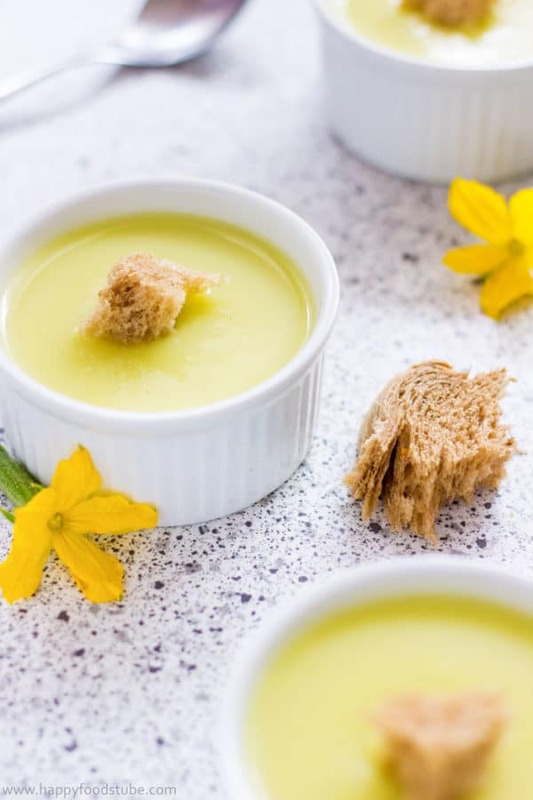 Dairy-free – coconut milk is used instead of cream. Nutrient rich – source of protein, fiber, vitamins A, C, K, minerals (calcium, iron, magnesium, potassium, …). 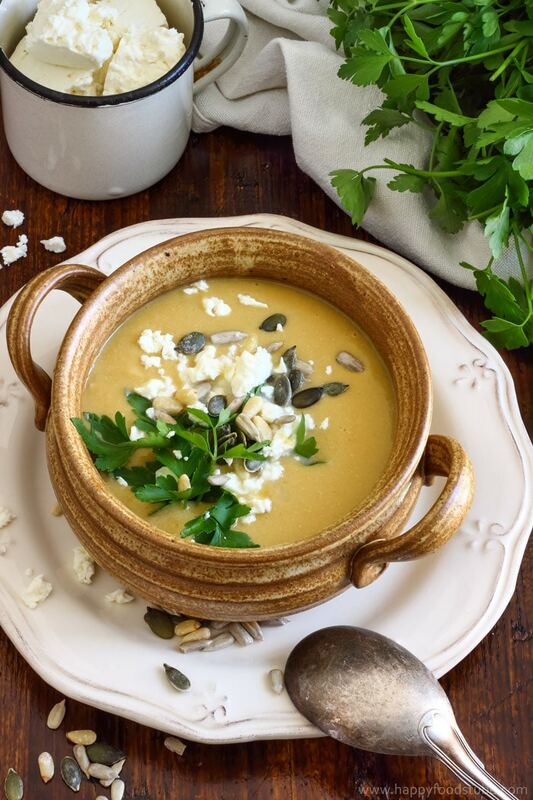 Creamy chickpea soup with coconut milk & Feta. This is a nutrient rich soup that tastes amazing. 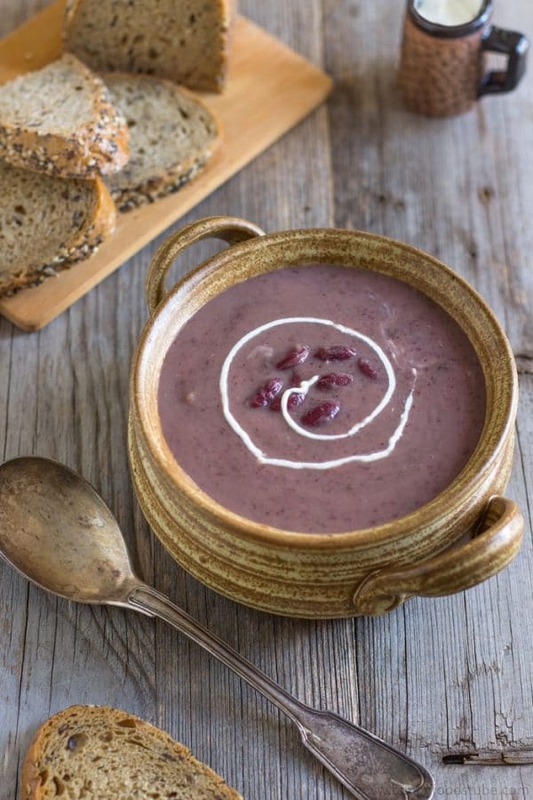 A great homemade soup that is also dairy-free & vegan. Dice the onion. Pour oil in a medium pot and throw in diced onion. Sauté on medium heat until translucent. Stir occasionally. Now it’s time to add chickpeas, peeled and diced potatoes, parsley (leave some for garnish), salt and sweet paprika. Pour in vegetable broth, cover with lid & ring to a boil. Reduce the heat and simmer on medium-low until the potatoes are cooked (This will take 10-15 minutes). Take it off of the heat and puree the soup until smooth. At last add coconut milk and simmer for a further 2-3 minutes. Pour into bowls. Serve with fresh parsley, seeds of your choice and feta cheese. I agree, soup really does do wonders in the Winter! 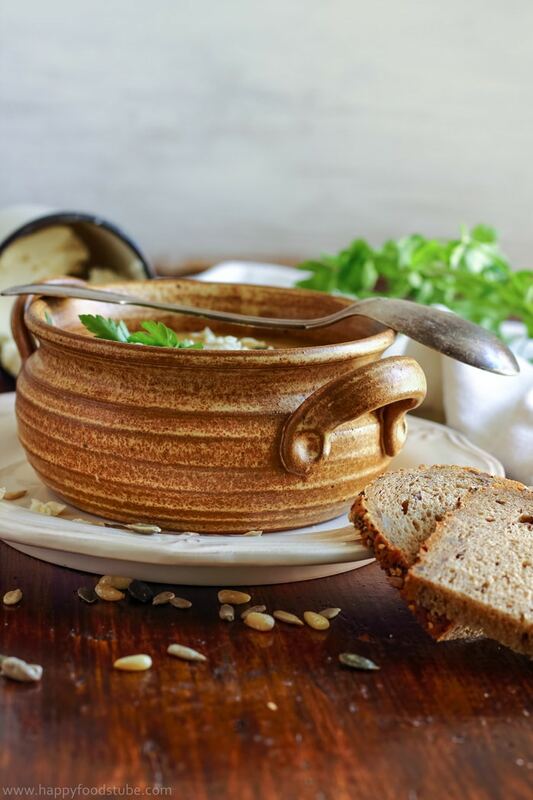 There’s nothing more comforting than a bowl of homemade soup! This looks so delicious; love the feta; it’s one of my favourite cheeses! 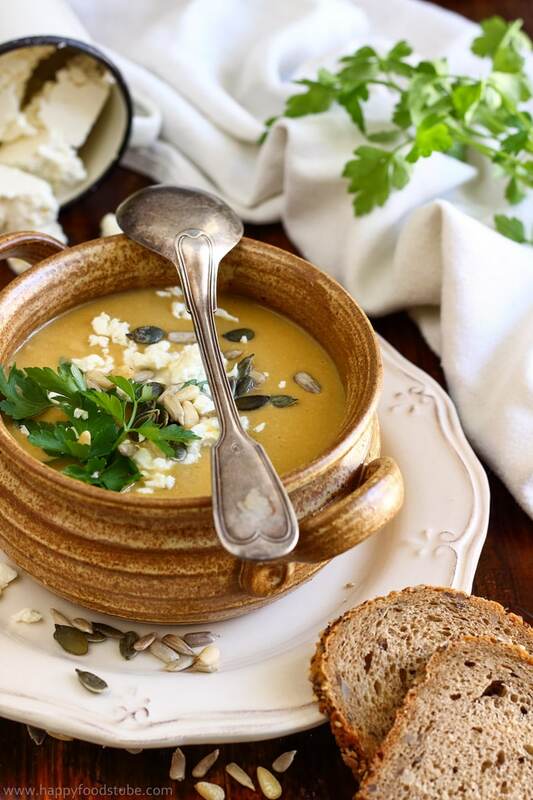 That soup is dressed to impress – lovely styling. It sounds wonderfully nutritious too – thanks for all the information. 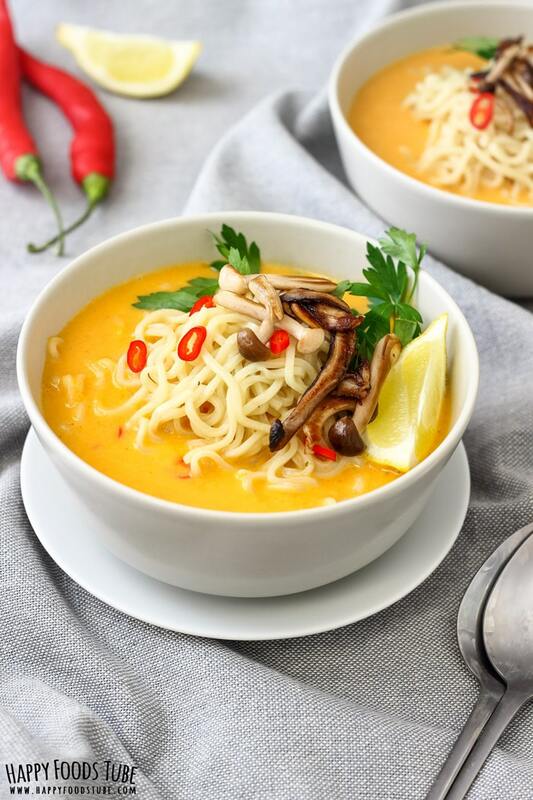 Love the use of the coconut milk! 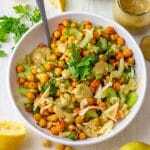 I love a great vegan recipe, thank you for sharing! It’s a delicious soup. Hope you’ll give it a try! I love anything with coconut milk. this looks amazing! 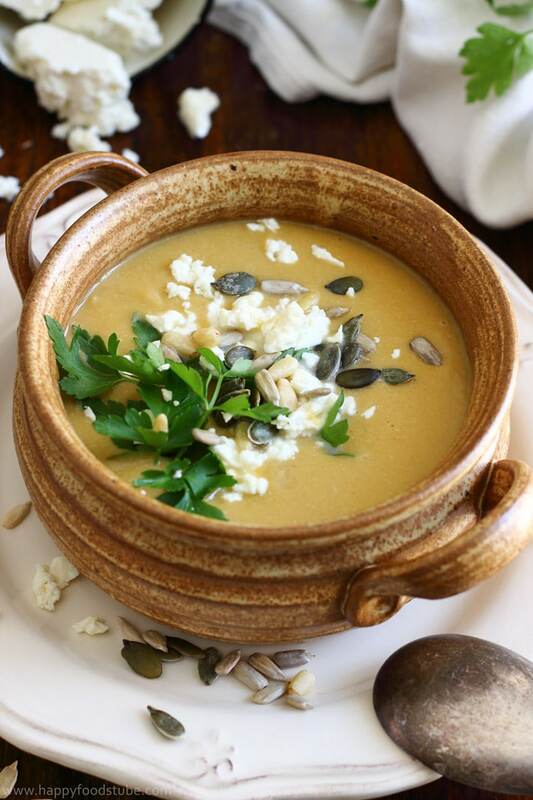 Great recipe :D I really liked the addition of coconut milk and feta cheese in this soup.